Shane Shirley : How to Be Green? 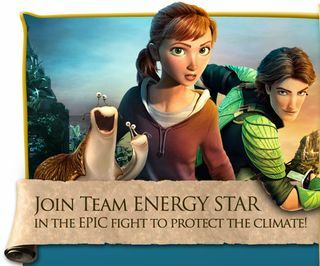 Join in the Epic Summer of Hollywood Fun for Your Kids with Team Energy Star and WIN Prizes! How to Be Green? Join in the Epic Summer of Hollywood Fun for Your Kids with Team Energy Star and WIN Prizes! I love Team Energy Star and all of the cool things they are doing to help educate kids about creating a healthier world with less wasted energy and more thought about protecting our resources. If you remember, last year my daughter Lexie won the Energy Star challenge and this year Energy Star is at it again and teaming up with Hollywood, LG Electronics, and PTO Today to get kids excited about learning to save energy. By Joining Team ENERGY STAR, Kids Can Earn Prizes Courtesy of PTO Today, LG Electronics USA and 20th Century Fox!! The first 200 families to submit an energy-saving story will receive 2 tickets each to see EPIC, courtesy of Fox. Kids will also get the chance to earn some great prizes from LG Electronics USA and maybe even see their name in lights in Times Square. Team ENERGY STAR puts the power in kids' hands to help protect the climate through easy-to-implement, money-saving actions and provides them an outlet for sharing their passion for preserving our environment. This year ENERGY STAR partners PTO Today and LG Electronics have brought in the heroic characters from the new movie EPIC, to help kids learn about the importance of saving energy while having fun at the same time. Kids can join Team ENERGY STAR to get easy-to-download interactives like an Action Kit with the ENERGY STAR Home Check-Up, an EPIC-themed activity booklet, and a Professor Bomba’s Binoculars kit to help kids see the world in a whole new way. Kids that share their stories about protecting the environment by saving energy will have a chance to win cool prizes. 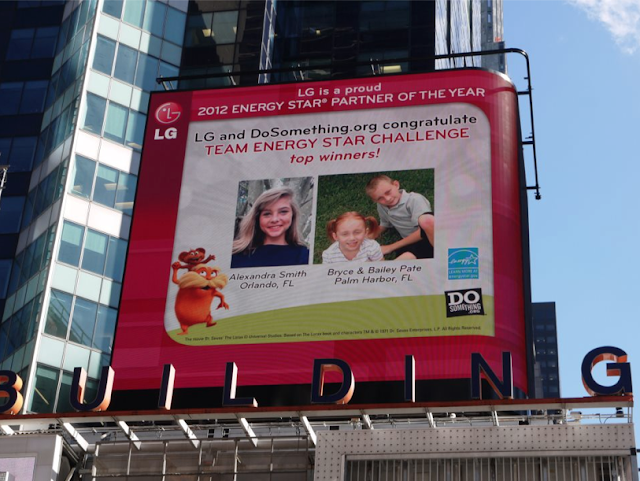 Stories will be showcased on ENERGY STAR’s social media pages and the top stories will be featured on LG’s electronic billboard in New York’s Times Square just like my Lexie was!! Team ENERGY STAR is part of the Change the World, Start with ENERGY STAR campaign that was created to get Americans of all ages on board with saving energy, money and protecting our environment with Energy Star. Literally millions of people are getting on board and joining with their neighbors, friends and family in this grassroots movement to help protect the climate by saving energy. You can see how people and organizations are making a difference by checking out the EPA’s ENERGY STARs Across America map. You can even attend an event in your area to learn ways to take control of your energy bills while contributing to a cleaner environment. And just like my family did, you can take the ENERGY STAR Pledge and join 3.2 million other Americans who are taking action to protect the climate. If every American household took part in the Change the World, Start with ENERGY STAR Pledge, we would save more than 130 billion KWh/yr of electricity, save $23 billion in annual energy costs, and prevent greenhouse gases equivalent to the emissions from 21 million cars. So join with us now!! Check out the Energy Star sight right now and click on “Submit your energy-saving success story” to enter to win cool prizes and learn about energy savings and be sure to tell your friends and family too! Have fun and good luck! FULL DISCLOSURE: I am writing about Team ENERGY STAR because I support the program and because I believe it is important to educate the public about energy efficiency and climate change. I have received a modest "thank you" reward from LG, an ENERGY STAR partner, in appreciation for my post. That gift in no way influenced my belief that saving energy is important and necessary.